What are the Biggest Industries in Russia? The petroleum industry is one of the largest and most profitable industries in Russia. Oil production in Bashkortostan, Russia. Russia gained independence in 1991, and as a post-Soviet country has been working to strengthen its economy ever since. Between 1999 and 2008, the economy of Russia grew at a relatively rapidly rate, giving the country an emerging market status. After the economic crisis of 2008, the Russian economy was forced to recover, reaching stability from 2010 to 2012. In 2013 and 2014, it experienced another downward turn due to economic restructuring efforts. Russia remains in an economic downturn, although its situation is expected to change in 2017. This article takes a closer look at the economy of Russia, particularly at the economic industries that contribute most to the gross domestic product (GDP). In 2015, the total GDP of the country was reported at approximately $1.33 trillion. In terms of the economic sectors of Russia, the services sector is the largest contributor to the economy, making up 60% of GDP. This is followed by the industrial (36%) and the agricultural (4%) sectors. The services industry is the most important sector of the economy of Russia. It includes a wide variety of specific economic activities, including: real estate, tourism, healthcare services, marketing, financial service, wholesale, retail trade, and personal and household goods. Retail is one of the biggest players within this sector, generating $316.44 billion in revenue in 2011. This amount represents around 60% of all household incomes before taxes. The importance of the service industry has increased significantly over the last few decades. In 1991, for example, it only comprised 38% of the GDP. Today, approximately 63% of the Russian workforce is employed by the service sector. Some economists suggest that this industry was able to grow so quickly because of the fall of the agricultural and industrial sectors after independence. The second largest industry in Russia is the industrial sector, which is comprised of the following economic activities: construction, manufacturing, electricity, and mining. Of these activities, one of the largest and most important is mining. Some commonly mined products include: gold, diamonds, copper, titanium, platinum, and oil and natural gas. The extraction, production, and sale of petroleum products, namely natural gas and oil, is one of the most profitable economic activities in this country. For example, in 2014, the oil and gas companies managed to produce 98% of all profits earned in the large corporations of Russia. 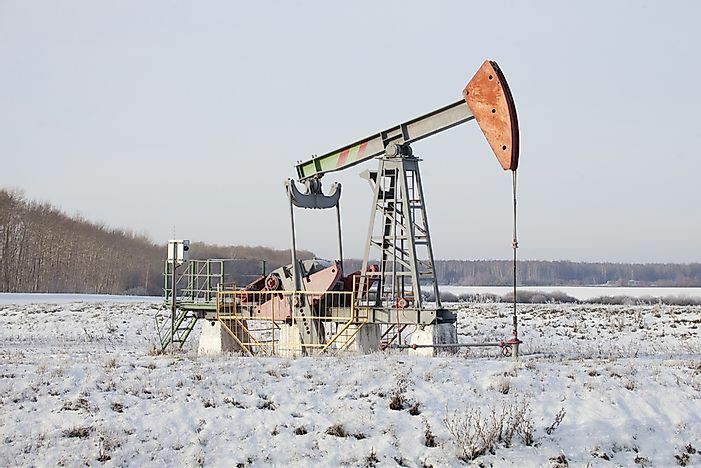 As of December 2015, Russia was producing an average of 10.83 million barrels of petroleum daily. It is one of the largest oil and natural gas producers in the world and exports more natural gas than any other country. In fact, the petroleum industry accounts for the 3 largest exports leaving this country: crude petroleum (28% of all exports), refined petroleum (18%), and petroleum gas (8%). Together, these products contribute $173 billion to the GDP, which represents around 13% of its total. Many economists point to the country’s reliance on the petroleum industry as the primary cause of its economic crisis, claiming that the lack of diversification makes it more susceptible to the fluctuating prices of the global petroleum supply.